Our people are the heart of our program. From the reception desk to the exam room, from laboratory to diagnostic suite, from the auditorium to the library, from administration office to faculty office you will find our people eager to help you become the best ophthalmologist you can be. 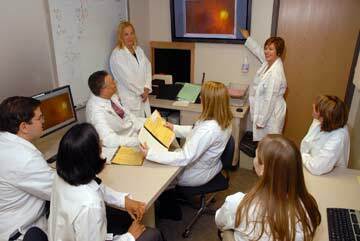 At Iowa, you will be exposed to some of the best clinicians, researchers and teachers in our profession. We provide high-powered opportunities for you to learn career-long lessons from these dedicated professionals.